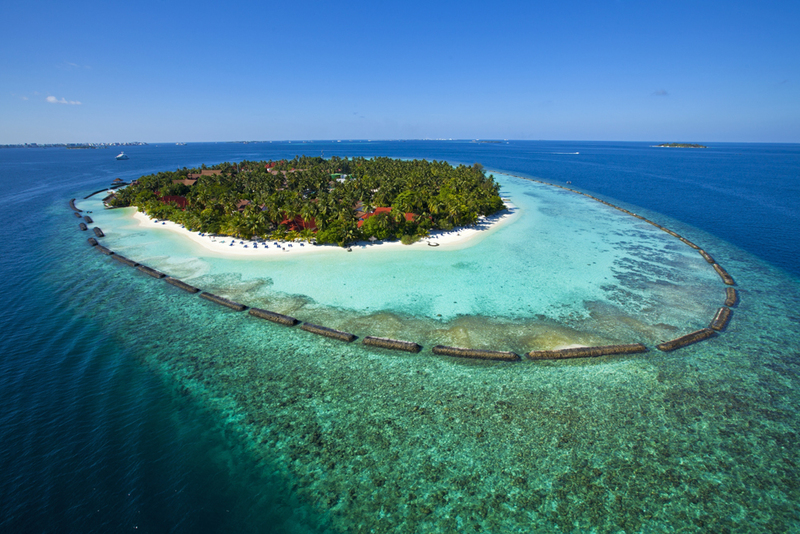 Kurumba takes its name from the Maldivian word for ‘coconut’, which grows in abundance across this tropical haven. Situated in the North Malé Atoll, merely 10 minutes via speedboat from both the capital and Malé International Airport, weary travellers will welcome Kurumba’s convenient location. Upon reaching the resort and receiving refreshments from the staff, guests can sink their feet into the powdery soft sands and feast their eyes on the azure waters of the Indian Ocean. A short boat ride from Kurumba Maldives, and you’re there- one of the prime surf spots on the planet. In the North Malé Atoll, the experienced instructors cater to students of all skill levels. The roar of the waves. The taste of salt and adrenaline. White foam over azure waters. A sense of victory like nothing you’ve experienced as you ride the barrel to the white sandy shore. 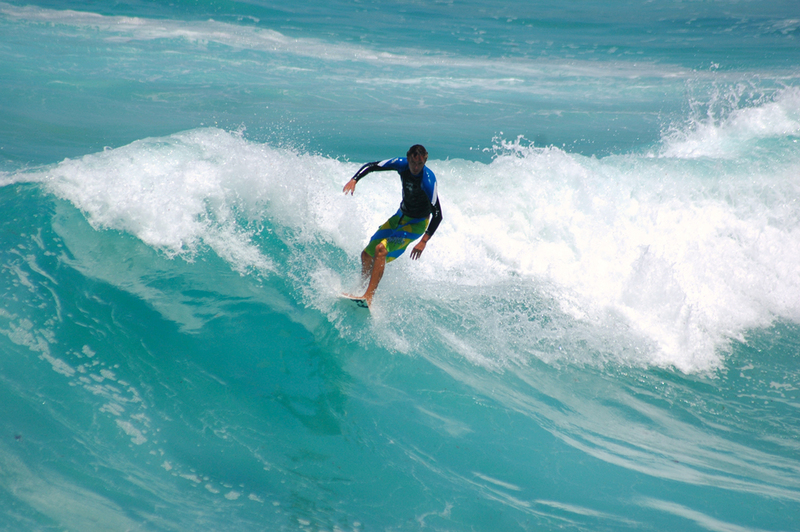 Surfing season in North Malé Atoll generally runs from mid-April to mid-October. Located on the west coast of the island of Sumba in Indonesia, Nihiwatu is a luxurious haven for active couples. The 21 beautiful private villas have been constructed by local craftsman in keeping with the island’s culture, providing unmistakable local soul and beautiful bohemian accommodation- some of the best in the world in fact. 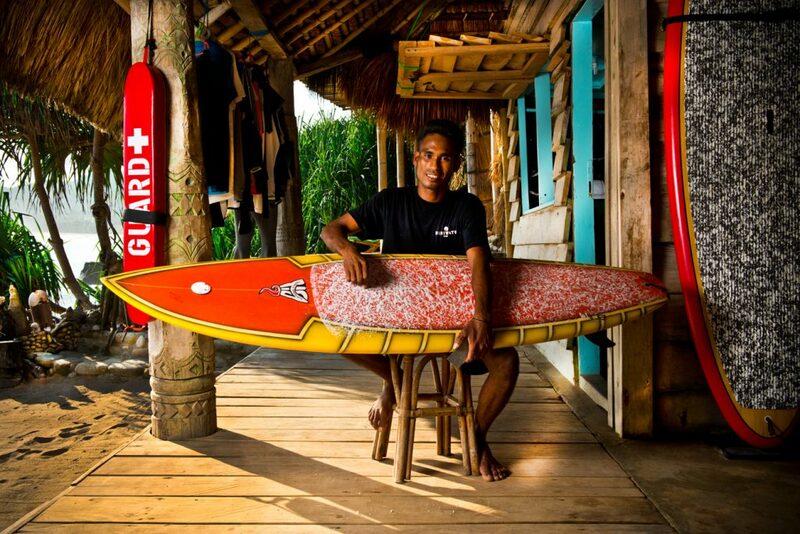 Now down to the surfing- due to Nihiwatu’s unique location on the West Coast of Sumba, the resort is exposed to swells generated by the Southern Ocean storms that travel thousands of kilometres across the Indian Ocean to the Sumba shores- to cut a long story short, Nihiwatu is surfer heaven. It is well known for ‘God’s Left’, a left hand break in front of the resort which attracts surfers from all around the world and is one of the many reasons that Nihiwatu has a cult surfing status. Couples of all abilities can book onto the many classes taught by experience Watermen at Nihiwatu but it is important to note that a minimum of ten surfers are allowed to surf here at any one time and pre-booking is necessary. Although slightly less exotic than other destinations on the list, Cornwall is renowned as a surfing hotspot and the beautiful rugged coast draws in many surfing pros throughout the year. 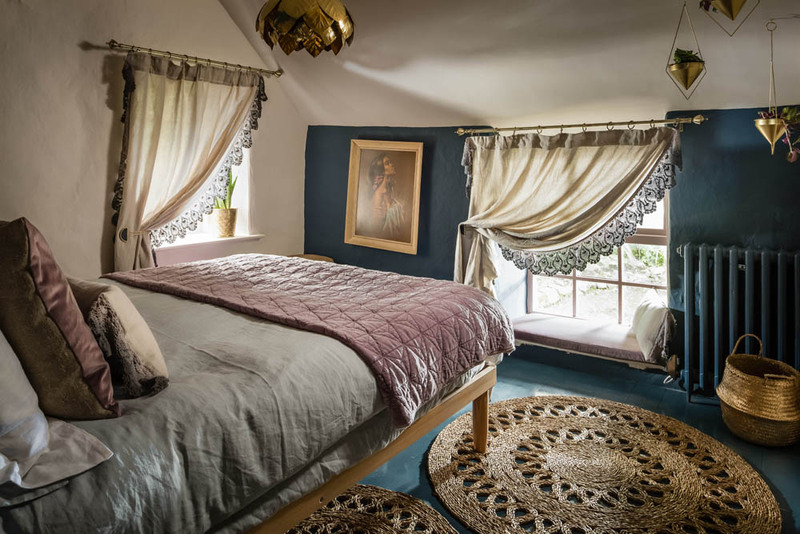 For couples searching for an inspiring bohemian hideaway for creative souls, let Siren seduce your wanderlust and take you on a journey down to Cornwall’s wild Lizard Peninsula. This luxury bohemian cottage is blissfully tucked away in Coverack Cove, commanding breath-taking views of the sandy beach and ocean beyond. There are three surf schools on the Lizard which cater to mixed abilities of surfing. The south coast of Cornwall has a more subtle exposure to the Atlantic however some of the most powerful breaks can be found here. A useful point to remember is that the conditions required to create good waves on the south coast are different so if the north coast is huge and howling onshore then you are likely get a decent wave on the south. The top beaches in this area include Kynance Cove, Porth Curno, Praa Sands and Porthleven. 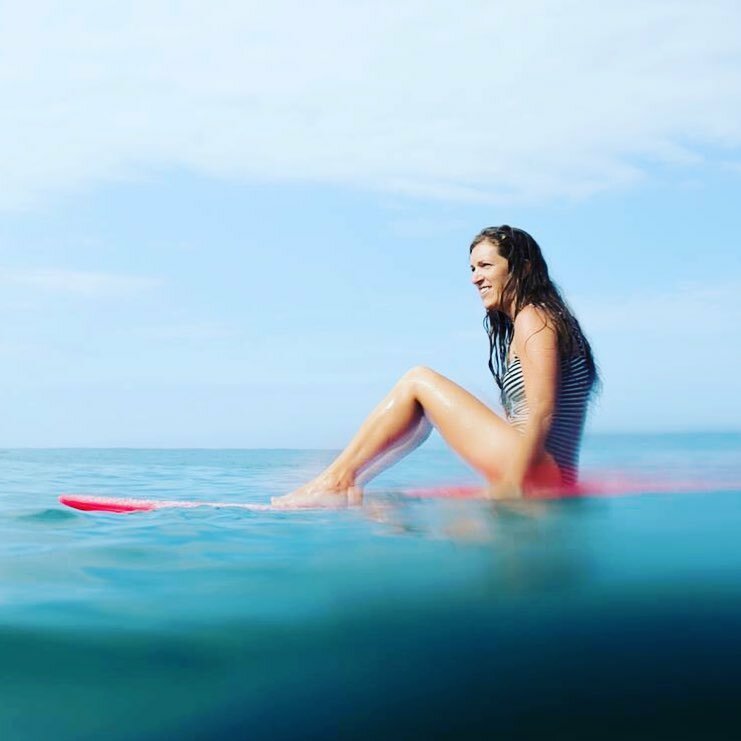 Soul & Surf’s second permanent home opened in Sri Lanka in November 2015 and is one of the only dedicated surf and yoga hotels on the whole island, offering week-long breaks designed to relax, rejuvenate and revitalise. Each day is typically welcomed with an invigorating morning yoga session or surf coaching at one of the many beautiful beaches, whilst afternoons are dedicated to gentle stretching and breathing under the canopy of the yoga shala. Sunset surf sessions offer up the perfect way to draw in the evening, with guided meditation and Pranayama offered afterwards to help calm the body and mind. New this year Soul & Surf Sri Lanka will be staying open during the off season (between June-October) to take advantage of this quieter time. 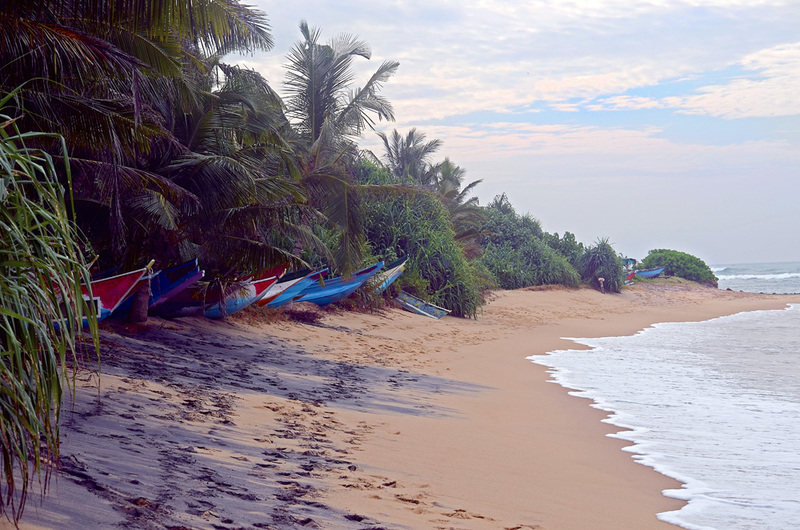 Sri Lanka receives fewer visitors from April through to October meaning airfares come down in price, there are less people to share the waves with and short sharp downpours are quickly replaced by bright tropical sunshine. It’s also the perfect time for beginners to learn to surf; with consistent rolling water and an excuse to rest up in a hammock during a tropical rain shower. 7 nights in low season (June-October) is available from just £675pp (reduced from £775 during high season) based on two sharing a standard room on an all-inclusive basis including return airport transfers, 5x 2 hour morning surf coaching sessions, 5x evening sunset surf sessions, 2x video feedback sessions, 1x surf theory lesson, 7x day surfboard hire, Soul & Surf rash vest, 5x afternoon yoga sessions, 2x morning yoga classes, 1x Pranayama session, 1x guided meditation session, 1x guided SUP session or river canoe ride and fishing with bamboo rod. Price excludes flights. For more information please visit www.soulandsurf.com. For those looking to catch some waves as well as rays this Summer, Surfers Lodge Peniche offers a stylish surf holiday with a difference. A laid back home away from home that combines stylish décor, comfortable rooms, a bustling restaurant and a first class surf school on Portugal’s unspoilt, central West coast. Guests can enjoy daily surf and yoga lessons with highly qualified instructors who are keen to help surfers improve surf technique (cinema room is available for post lesson analysis), explore the glorious coastline and enjoy fabulous cosy comforts back at the lodge. At the heart of the Lodge is a first class Surf School that caters for all abilities, from absolute beginners looking to ride their first wave to experienced surfers looking to brave the famous, explosive Supertubos. Tuition is highly individualised and groups are small (maximum of 6 people per teacher). Easily accessible from the UK, visitors can fly from London to Lisbon with TAP, BA, EasyJet and it is just 1 hr transfer time to Peniche. A 7 night stay including breakfast and daily surf lessons is from 1,567 Euros based on two people sharing a twin room. 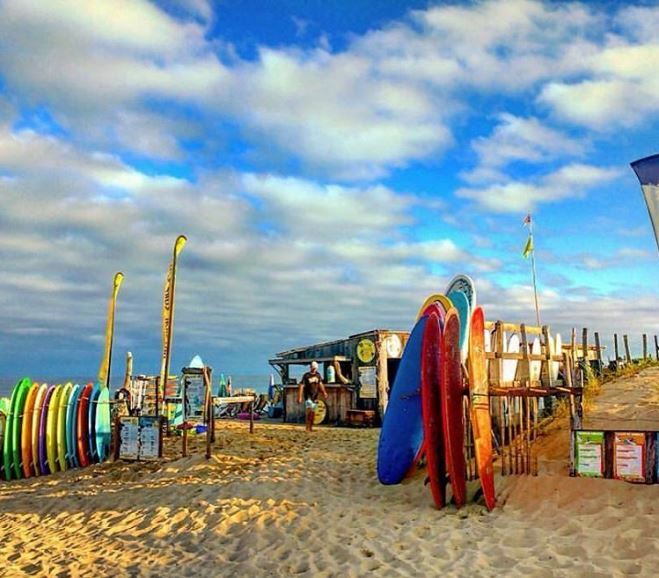 Located on the south Atlantic coast of France, the Natural Surf Lodge is an eco surf school and a surf camp situated in Seignosse Landes, one of the best place to surf in France, famous worldwide for its magnificent beach breaks. The Lodge itself is worth the visit and is a welcome retreat after intense surf sessions. With over 15 years of experience, Claire, Stephan and their locally trained surf team help you with surfing techniques and provide you with crucial ocean and environmental knowledge to enjoy the surf responsibly. Nestled between pine forest and ocean, a short walking distance from the Etang Blanc nature resort, the Natural Surf Lodge is a bed and breakfast run by surfers for surfers in a 300-year-old farmhouse which has been completely renovated: a mix of authenticity and originality. For couples, we recommend the private bungalows for the ideal romantic surf trip. 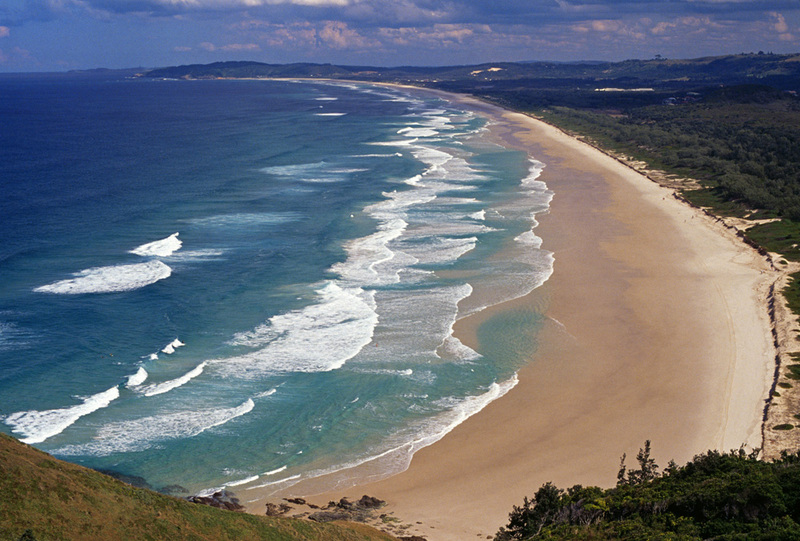 Byron Bay is a coastal town on the New South Wales North Coast best known for its beaches and surfing sites. The Byron at Byron Resort is located within a unique environment surrounded by a majestic, 45 acre subtropical rainforest, only moments from Byron Bay town centre and Tallow Beach making it the perfect retreat location for surfing-enthusiast couples. The Byron at Byron Resort Two Day Byron Break package invites guests to experience the best of Byron Bay, giving them access to the town’s truly spectacular surfing beaches. Guests are also invited to unwind from the day’s activities indulging in the many elements of the five star resort, including the gourmet restaurant, award-winning day spa and relaxing daily yoga. The Family run Lucero Surf Retreat offers an all-inclusive Surf and Surf/Yoga holidays & custom build packages to Santa Teresa, Costa Rica. Lucero is located in the town of Santa Teresa, a small popular beach village on the Pacific coast. The beautiful white sand beaches you find here are known for some of the best surfing in the entire country and ideal for surfers of any level! This booming travel destination offers a pristine jungle view from the beach- it is a complete back to nature experience. The owners, Marieke and Jared provide a fun, friendly learning atmosphere for surfers and yogi’s of any level with a lot of personal attention due to the intimate family run nature of the retreat. The packages include accommodations that they work with at some of the most beautiful boutique hotels in Santa Teresa- right by the beach, with daily breakfast and lunch, surf lessons, fully equipped, activities and/or yoga, – but also with enough time to relax, read a book, explore the town, join additional activities or lay on the beach! All the ingredients for an amazing Surf vacation in Costa Rica are here! memmo Baleeira, in Sagres, is situated in Costa Vicentina Natural Park. High on the cliffs overlooking the sandy bay and harbour of Baleeira below, this whitewashed gem is surrounded by sheer cliffs, crashing waves and unspoilt beaches. A perfect destination for couples wanting to escape for some sun, fun and surf in the long summer months. Health and fitness is key at memmo Baleeira, and the highlight is, of course, the coastline, home to some of Europe’s best surfing beaches. The hotel has its own surf centre where former pro-surfer, Joao Mealha, is just one of the teachers who can offer private or group instruction, for all abilities. Outdoor activities also on offer are fishing, trekking, yoga retreats, dolphin watching, sailing, boat trips, bicycle and jeep rides. The hotel has a dedicated spa with marine based therapies, a Turkish bath, sauna and an indoor and outdoor cliff top pool. Once upon a time across the bluest of oceans, an island was born of lava and sand – an untouched paradise whose heart was a turquoise lagoon of unimaginable beauty and tranquillity; that island is Fiji. For a luxury escape just for couples, you can’t get much more perfect than Likiliku Lagoon Resort. Likuliku offers 2 person bures either over water or on the beachfront, all of which l have breathtaking Lagoon views. 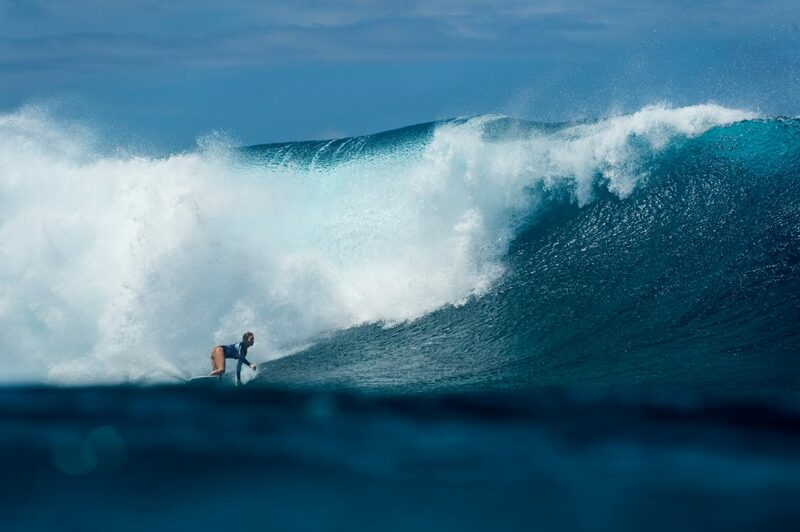 Surfing is second nature to anyone living on the beautiful island of Fiji and Likuliku recognise that guests will want to take advantage of the awesome surf. They offer lessons as well as board hire for all budding-wave riders.